Do you want a fast and easy-to-create container garden? Here is one way to create a large container in just a few minutes! This is a great way to garden on your patio, or to enjoy gardening while standing or sitting down. First, buy large, plastic concrete mixing trays. Get ones that are at least 8 inches deep, made of sturdy material. I selected one that is 2 foot wide, 3 foot long, and 8 inches deep at Home Depot. It holds 20 gallons (80 quarts) of potting soil. This is a 2'x3'x8″ concrete mixing tray that cost about $13 in 2014. I turned it over, and drilled numerous holes all across the bottom. It's important to provide good drainage. Use a drill to make numerous drainage holes across the bottom. Flip it back over. If you've drilled large 1/2″ holes, like I did, put a piece of weed barrier in the bottom, to keep soil from falling out. If you used smaller 1/4″ holes, you won't need the barrier. If you've drilled large holes, cover them with a piece of weed barrier before filling the container with potting soil. If the holes are smaller (only 1/4 inch), you won't need the barrier. Fill up the container with potting soil, leaving 1 inch space at the top, to keep soil from being washed out when you water the container. Be sure you place this container where you want it before filling it, as 20 gallons of moist potting soil can weigh 100 pounds! This isn't a container that you can easily move around. Give it sturdy support. We place ours at waist height, making them very easy to work in. You can even sit down in a chair to work in them! These 20-gallong containers can weigh 100 pounds! So make sure you give them sturdy support! I love having these containers at waist height. They are very easy to work in. We only used an electric hand drill to create the holes – no other tools were needed! I've successfully grown lettuce, carrots, spinach, Japanese turnips, miniature cabbages, green onions, kale, endive, and many other small vegetables in these containers. If you want to grow larger plants (tomatoes, watermelon, squash, etc), you should use deeper containers (10-12 inches). This container works very well with small vegetables, including miniature cabbages, carrots, turnips, kale, lettuce, spinach, and more! These containers are a great way to grow salad greens on your porch or deck. Ripe strawberries growing in our waist-high containers. This is our favorite way to grow strawberries now – no aching backs from working down at ground level! Think you can't grow carrots in an 8-inch-deep container? Think again! Just choose varieties of carrots that mature at 6-7 inches long. My miniature cabbages thrive so well in my containers that they grow about twice as large as they do in my outdoor garden beds! These are the largest vegetables that I grow in 8″ deep containers, and I can only fit about 3 of these plants in each 20-gallon container. Three of these size containers equals about one 4′ by 4′ square foot garden bed. My 3-year-old containers are still holding up fine, though if you bump into them hard, the outer edge might crack a little. If you would like a container that would be smaller and easier to move around, use a storage container, like a 10 gallon Rubbermaid one that is 8 inches deep. It will weigh about 50 pounds when full of moist potting soil. Many people have successfully used 5-gallon buckets, too, though bigger vegetable plants may not grow very large with such limited soil. Fabric pots, such as Smart Pots , are another great type of container. Their advantages include: 1) they drain very well, 2) the entire container “breathes”, 3) the container remains cooler in hot weather, and 4) the plant roots are naturally air-pruned, producing healthy, bushy root systems. It's very important to use good quality potting soil in containers. The Mel's mix recipe works great – though I always add about 1 pint of organic fertilizer to each 20-gallon container. Every time you water, nutrients are leached out of the container, so I make sure there are extra nutrients to start with. I've also discovered that it's much better to use vermiculite than perlite in this kind of container, as vermiculite does a much better job of holding onto nutrients. I'm very new to container gardening, having done it only since 2010. I discovered the hard way that my plants can develop serious nutrient deficiencies if they are not fed liquid fertilizer every 2 weeks, after they've been in the container with fresh soil for a few weeks. It can also be very challenging to keep these containers moist during hot weather. I searched far and wide for more information about growing vegetables organically in containers, and finally found a book that offers fantastic information: The Vegetable Gardener's Container Bible: How to Grow a Bounty of Food in Pots, Tubs, and Other Containers. I highly recommend this book! The author, Edward Smith, strongly recommends using self-watering containers for most vegetables. Using self-watering containers would solve 2 of my worst problems – keeping the containers moist, and keeping nutrients in the soil. What vegetables have worked well in containers for you? What kinds of containers or potting soil have you used? Do any of you have experience with self-watering containers? Let us know in the comments below! Thanks a million on the container garden article! Ive been doing lots of research for growing vegetables in containers and in a small amount of space witch is how i stumbled onto your site. My studies have also been on the self watering containers. I have designed a raised square foot self watering bed that also recycles any extra water from rain. I have seen several sights that recommend using coconut coir as the wick to draw water from a reservoir into the soil. If i understand correctly u have soil mixed with the coir. In my opinion that would be excellent to fill small containers with holes sitting in a water filled container going up into a soil filled container where the plants would be growing. If you can visualize a 2 story house. -The bottom floor would consist of a container suitable for holding water. With a hole drilled through the side to drain any water if over filled so that it doesn’t back up into ur planting soil. – The stairs would be small upright containers capable of holding your wick material (coconut coir and soil mixture) while absorbing the water from the bottom floor. -The bottom of the upstairs floor in your situation would be the soil coconut coir mixture. One half to a quarter of an inch throught the container should be sufficient. This is to spread the moisture from the “stairs” throughout the container. Think of this as the flooring. – Then place your soil for planting on top of this to your desired depth. You have several choices of how to get water into the reservoir. The easiest is to take a piece of pipe cut long enough to go from the bottom of the reservoir to about an inch above ur planting soil level . Cut the bottom of the pipe to an angle so it doesn’t sit flat on the bottom of the reservoir. Fill your soil in around the pipe. * Make sure all soil and wick materials are moist to the point that if u squeeze into a ball it will hold form with out having water run out before filling containers. * Now plant your vegetables on top and use the pipe to fill reservoir till water starts coming our your drainage holes. * Depending on the size reservoir, growing temperature, and type of plants you should only have to ” top off “the reservoir everyday. If anyone is interested in more details or how to male it recycle water just let me know! Kim, thanks so much for sharing all those details! Since I’ve been reviewing a lot of articles and YouTube videos about this topic, I can visualize what you were describing. Although I haven’t yet seen it mentioned, I agree that coir would be a great wicking material. When I take a dry block of coir, and set it in some water to moisten, it swells up with water very quickly (unlike peat moss). I like the idea of using it as a thin base on the bottom of the planting container, to distribute the moisture more evenly. That’s also an idea I haven’t heard before. Unfortunately, my problem is that 1/3 of my potting soil is coir, and I’ve read that it can hold too much water when used as a soil mix in self-watering containers. I’m going to experiment with what I have anyway, as I’m not up to mixing up over 200 gallons of new potting soil this spring! I’m also experimenting with using fabric wicks to draw water from the reservoir up into my container, as I don’t feel like creating soil columns as wicks right now – we have too many containers to do that before spring planting. If I end up having to create soil wicks, I will do them a few at a time over the next year. My reservoirs will hold about 8 gallons of water for each 20 gallon container. So I’m hoping to just have to water twice a week, except during extremely high temps. I have a 300 gallon rainwater tank right next to our hoop house, but I haven’t worked out an easy way to get that water into our containers. I don’t feel like hauling all that by hand! Hi, this will be my fourth year using Earthboxes on our second floor deck. I also added a CityPickers box last year. I think I paid $32 each for the EBs and $29 for the CityPickers. Not cheap, but they really hold up and the plastic is foodgrade, so I don’t feel as concerned about chemicals leaching into the soil. I use ProMixBX (about $55 per bale) for the medium. It’s great stuff, wicks wonderfully. The EBs and CityPickers work great for tomatoes and bell peppers. Actually the tomatoes were in the EBs. I grew indeterminants (pruned) using Tomato rings, which worked well. (I’m going to try determinates this year though and try canning.) My peppers in the CityPickers box were 5′ tall and I still have peppers in our freezer (granted I would much rather garden than cook!) I’ve also grown strawberries in an EB but I don’t think they work quite so well for that. Last year was my strawberry box’s 2nd year and half way through the summer the cover was disintegrating, making it much less of a self-watering container. I probably should have attempted to replace the cover despite the full size plants. Also I wasn’t sure if I had refreshed the fertilizer correctly. So I’m interested in these concrete mixing trays for strawberries. What fertilizer do you use for your strawberries? I’ve seen fertilizer advertized specifically for strawberries and was tempted. Hi, Deanna! I thought I was the only one that would rather garden than cook. 🙂 Now I don’t feel so weird! Sounds like you have a great self-watering setup. I didn’t know that peppers could grow so tall! Wow! Ed Smith in The Vegetable Gardener’s Container Bible recommends using 1 cup of a general blend of organic fertilizer for every 10 gallons of soil you are refreshing, along with enough new compost to make up for what decomposed the previous year. But that’s when you can remove the soil from the container to mix it all together. The strawberries are a multi-year crop, so you can’t do that. I don’t think you need a special fertilizer for strawberries. This will be our 4th year using these trays for our strawberries (our second planting). I actually had the potting soil for our strawberries tested this spring, as we have 100 plants! I had used the Mel’s mix soil recipe, but had also added 2 cups of organic fertilizer per 20 gallon container, and 1/3 cup lime. After one year, the test indicates that the soil now needs nitrogen, phosphorus, some trace minerals, and some sulfur (slightly too high pH). My strawberry containers won’t have any “covers”, even if I manage to convert them to self-watering – though I will still probably use grass cuttings as a mulch on the containers. I plan to add 1/2 of the fertilizer on the soil surface this week, cover with mulch, and add a few composting worms to the containers, too. 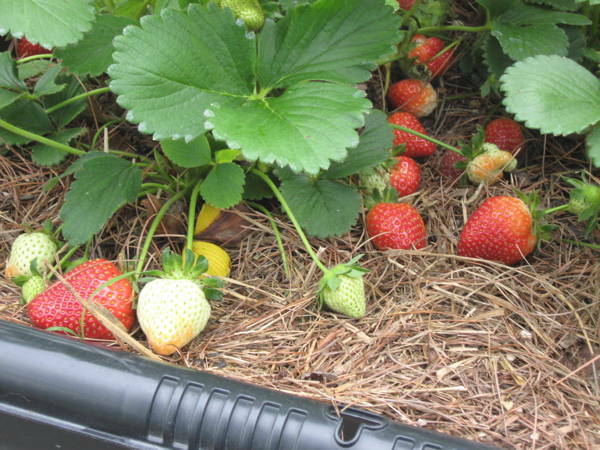 The rain and worms will help to distribute some of the fertilizer, and a lot of the strawberry roots are growing right up to the surface, and can pick up the fertilizer there. I’ll spread the other half of the fertilizer in mid-summer. If the self-watering system works, most of the nutrients will be retained in the soil this year, instead of being washed out – unless we have another extremely rainy summer like we did last year. Guess that’s what your “covers” are meant to prevent? We’ll see how everything goes! Best wishes! I’m a reader from France. I see you can successfuly grow carrots and cabbage in only 8″ deep soil. Which varieties of these 2 vegetables are you using ? Hi, Nicolas! My favorite summer variety of carrot is Nelson. But you can use any variety that matures to just 6-7 inches long. My favorite mini cabbages (so far) are Parel from Territorial Seeds and Super Red 80 from Johnny’s Selected Seeds. But there are many other miniature cabbages available. Parel is incredibly sweet, tender, and juicy, and matures in less than 8 weeks from transplant. I absolutely love it! Have fun!